Considered one of the greatest all-rounders of all time. One of the true greats of the cricket world. Gary Sobers was one of the most entertaining all-rounders. During the 1960s he was both one of the greatest batsman and also greatest bowlers of the decade. He was also an excellent fielder and delightfully modest – a true gent of the game. He is remembered for three particular feats of batting. His 365 not out for West Indies vs Pakistan in 1958, stood as the highest test score until 1994. Hitting 6 sixes in one over at Glamorgan in a county cricket game. His last 6 was hit way out of the stands and remains one of the very rare occurrences that this has occurred. His 254 in Australia playing for a Rest of the World XI – Don Bradman described it as simply the best innings ever played in cricket – a historic moment for the game. 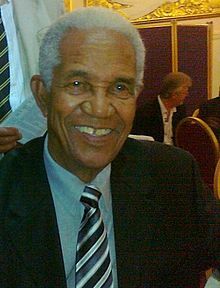 In 93 tests, Gary Sobers scored 8,032 runs at an average of 57.